The forest steeped in deep legend and mystery. The word Sinharaja means, lion (Sinha) king (Raja) and the popular belief is that the legendary origin of the Sinhala people in SriLanka is from the descendants of the union the lion king who once lived in the forest and a princess. 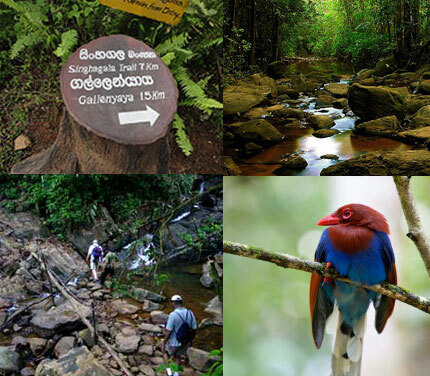 Sinharaja Forest Reserve is one of the least disturbed and biologically unique lowland rain forests now remaining in Sri Lanka. As you walk deeper in to the forest you will come across many mini waterfalls and streams that holds the key element of any eco system in the world. The terrain gets rough and the elevation inclines steadily as you proceed. You are walking through a rainforest so be prepared for leeches and for the random showers that will bring the adventurer in you. Personal effects for warm, windy and rainy conditions. Light weight clothes and trekking shoes or boots. The services of a trekker.